Let's continue with No. 6, the wild-from-the-start 2017 Wild Card Game. On No. 12 in our countdown, we recapped 2017 ALCS Game 4, in which the Yankees came back in the late innings. Just a couple weeks earlier, the team had pulled off a similarly impressive comeback ... in the first inning. In the first playoff game for the Baby Bombers, the Yankees erased a 3-0 lead off the bat in front of a raucous Yankee Stadium crowd to beat the Twins in the 2017 Wild Card Game. The Yankees owned homefield advantage in the one-game playoff and seemed a heavy favorite despite baseball's unpredictable nature. After all, it was Yankees-Twins in the playoffs at Yankee Stadium. That tends to only go one way. But Luis Severino simply didn't have it amidst the postseason jitters. He touched 100 in the first at-bat of the game, but leadoff hitter Brian Dozier took him deep on a 3-2 pitch. Three batters later, Eddie Rosario launched a ball into the short porch and the Twins had a 3-0 lead. Severino would last just six batters and retire one, leaving men on second and third. It's funny, but Chad Green essentially saved the game in the first inning. Not allowing the Twins to create breathing room, the powerful reliever blew fastballs by a pair of Minnesota batters for two strikeouts. As in the top of the inning, chaos reigned in the bottom of the first. Twins starter Ervin Santana had playoff experience, but the veteran righty had similar fortune to his opposition. Brett Gardner drew a walk, bringing up Rookie of the Year, Aaron Judge. Judge also worked the count before converting an uncharacteristic hit-and-run with a single. With runners on the corners, the Yankees were set up well. 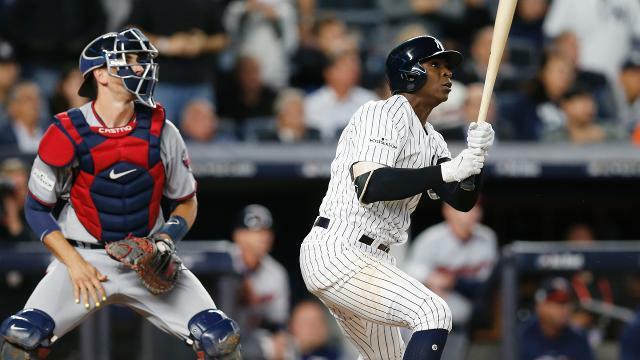 After a Gary Sanchez pop out, Didi Gregorius came up and also got the count to 3-2. Once there, Didi didn't miss. He smoked a liner into the right-center field seats for a three-run homer. Just like that, it was a tie game, and the Yankee Stadium crowd sounded like it had crossed over from the House that Ruth Built. In the bottom of the second, Gardner again saw plenty of pitches against Santana before blasting a homer to right field. Green and David Robertson would allow the tying run in the third, but Greg Bird greeted reliever Jose Berrios with a go-ahead single in the bottom half, giving the Yankees the lead for good. Despite grabbing a 5-4 lead, the Yankees weren't done. Following a Gardner single in the fourth, Judge did what Judge does: Homered! His line drive barely cleared the left field wall, but it gave the Yankees a 7-4 advantage. Pitching a career-long 3 1/3 innings, David Robertson carried the ball in to the sixth inning, though he would be officially tagged with a blown save despite his lone run allowed coming in the third inning. After Sanchez shook off a foul tip, Robertson walked Dozier to bring up Joe Mauer as the tying run. However, Tommy Kahnle would induce a flyout to snuff out the rally. From there, Kahnle and Aroldis Chapman held down the game. Aaron Hicks would work an RBI walk in the seventh to make it 8-4, the final score. Chapman struck out three of the four batters he faced in the ninth, closing the game with a flourish. In total, the Yankees' bullpen threw 8 2/3 innings, allowing just one run on eight baserunners while striking out 13 Twins. Robertson earned his fourth career postseason win. The win set the stage for Yankee Stadium's affect on the 2017 postseason. The Bombers would win elimination games in the Bronx in Game 3 and 4 of the ALDS against the Indians before sweeping Games 3-5 against the Astros in the ALCS.